JOINT BASE ELMENDORF-RICHARDSON, Alaska—Lightning diverter strips sitting flush – check. Hydro lines show no evidence of leaks or chafing. All of the 179 other items on the basic post-flight inspection – check. It’s a 40-minute inspection, done every time an aircraft returns from a sortie, and on Oct. 14, it was the 5,000th-time Tech. Sgt. Jeremiah Frye had evaluated a similar maintenance action. Frye is a full-time Air Force Reserve quality assurance inspector with the 477th Fighter Group at Joint Base Elmendorf-Richardson, Alaska. He has dedicated nine years of service to a position that is typically filled for three years or less. In that time, he has completed the amount of inspections that typically takes around 28 years to accomplish. This was more than just another day on the job for Frye because, for this milestone achievement, he was to be accompanied by the last living Tuskegee Airman of the 477th Bombardment Group. Additionally, the inspection coincided with the 10th anniversary of the 477th FG, which carries on the Tuskegee legacy. 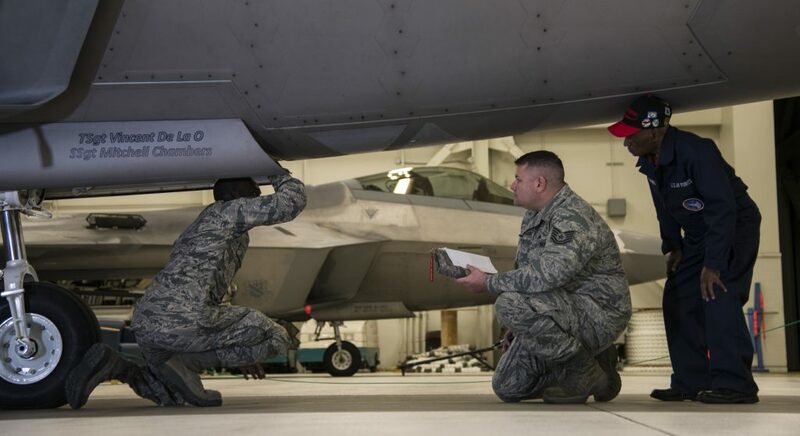 Quality assurance personnel are the primary technical advisory agents for maintenance actions and review tasks involved in supporting the maintenance effort. Honeycutt says most inspectors average between 300 and 350 inspections annually. He says it’s doubtful that anyone else in the Air Force has hit the kind of numbers Frye has. Being a quality assurance inspector has taught Frye to be flexible to overcome hurdles. For his 5,000th inspection, Frye was to evaluate U.S. Staff Sgt. Stephen Teamer, 477th Aircraft Maintenance Squadron crew chief, and the work he performed on an F-22 Raptor. Adding to the uniqueness of the occasion, Frye conducted the inspection with U.S. Army Air Corps Staff Sgt. Leslie Edwards, 93, the last known living Tuskegee Airman of the 477th Bombardment Group which became the 477th FG in 2007. As Airmen and Soldiers gathered around to watch history in the making, Edwards explained that during his term of service in World War II, when a pilot took off for a mission, there was a very good chance he would not return home. “Today, because of the efficiency of your inspections, when a pilot gets in that jet, he’s going to be able to do a whole lot of damage to the enemy, but more importantly, he’s going to be safe,” Edwards said. “He’s going to come back home to his wife and children. He’s going to come back home to his mother and father. Completing his 5,000th inspection with a Tuskegee Airman by his side left quite the impression on Frye. As he continues to set the standard for quality assurance, Frye isn’t satisfied just because he has hit this landmark achievement.